When the roads around your home have been closed, the neighbourhood bus re-routed and 12 semi-trailers, a 250-tonne crane and 30 or so people turn up, you know something special is happening. For Simon and Kate Hutchings, this was the extension to their Californian bungalow in Ivanhoe being delivered. 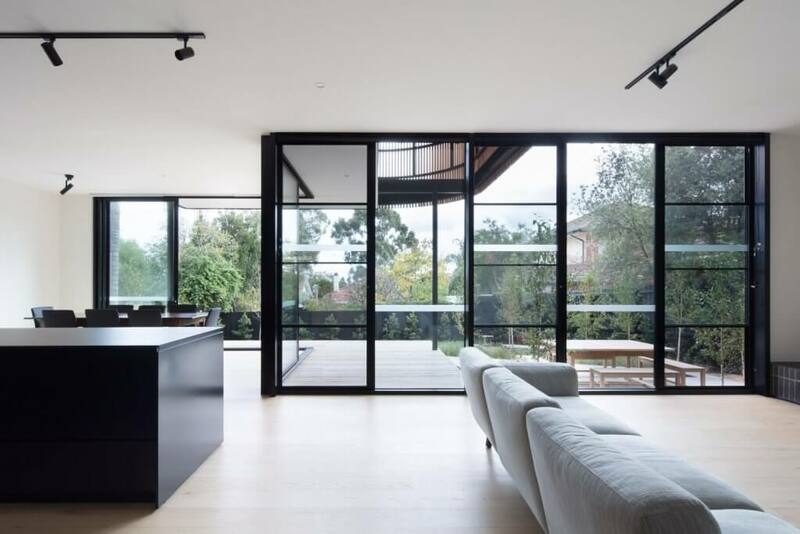 Designed and built by Melbourne modular manufacturer, Modscape, it would be fair to say the extension is a long way from the boxy dullness most people expect of a prefabricated build. It is a beautiful, light-filled, two-storey space designed by architects and built by skilled craftsmen. The extension comprises a living and dining area with a large kitchen and butler’s pantry on the ground floor, and a spacious first-floor main bedroom suite and study that cantilevers out over the garden. 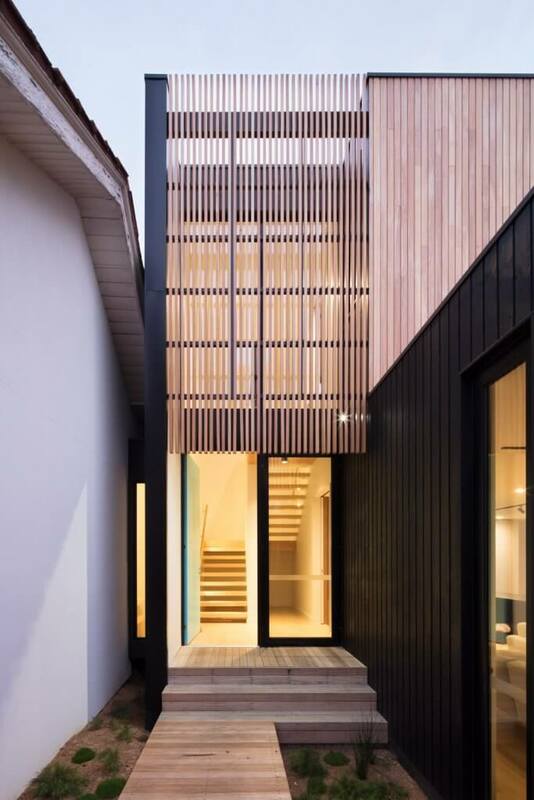 A glazed double-height link joins the extension to the original house, which has become the domain of the couple’s three teenage boys, Will, Zach and Noah. On the first floor, a stunning curved screen of timber battens further emphasises the bespoke nature of the project and provides creative shading and privacy. “I love the contrast of old and new – the surprise of it,” Mr Hutchings said. There are essentially two main types of prefabricated construction – panelised and volumetric. With a panelised system, walls, floors and roofing are made in the factory, transported as a flat pack, and assembled on site. The Hutchings’ extension was a volumetric system where “rooms” or modules are built in the factory, trucked to the site, lifted in by crane, and then hand-finished. The family had several reasons for choosing modular over a traditional build. They live on a major road, which would have been difficult for a busy build, had no desire to go through the two-year process, and weren’t keen to risk a bad builder. Other advantages to the prefabricated process include the meticulous attention to quality that is possible with building in a controlled environment: worker safety is greater than on site; there are no weather delays; cost benefits are numerous; and waste is greatly reduced because of production repetition and because materials are not damaged by the weather or stolen from the site. But modular building is not all that well known in Australia, and people still tend to think of mining camps and mundane granny flats when they hear the term. Companies like Modscape are changing this. Modscape’s homes and extensions are contemporary, design-led with superb proportions and meticulous detailing. Options for design and finishes are limitless. “Modscape appealed to us because it is a creative company,” Mr Hutchings said. “We could get a very bespoke build. We talked to a few other companies, but they weren’t creative with the limitations of the modules. The Hutchings started the design and permit process with Modscape in February 2017. They moved into their finished house the following September. “Most of our projects take about nine to 12 months from when a client signs up to when we are handing over the keys. It’s very much dependent on the council approval process,” Modscape managing director Jan Gyrn said. Factory build time is about 12 weeks; installation usually takes a day; and finishing on site is usually completed in seven to 10 days. The cost of building a prefab home or an extension varies greatly and depends on a wide range of factors. Modscape homes are of a high quality and designed specifically for each client’s requirements, budget and site. Mr Gyrn says that as a broad range, the majority of the company’s residential projects work out about $2800 to $5000 plus GST per square metre. Another thing that sets Modscape apart is its focus on sustainability in design, materials used, manufacturing and site works. Financing a modular home can be a challenge, with banks treating the sector conservatively. There has been a reluctance to lend on what amounts to materials in a factory, but manufacturers report that financing is becoming easier. 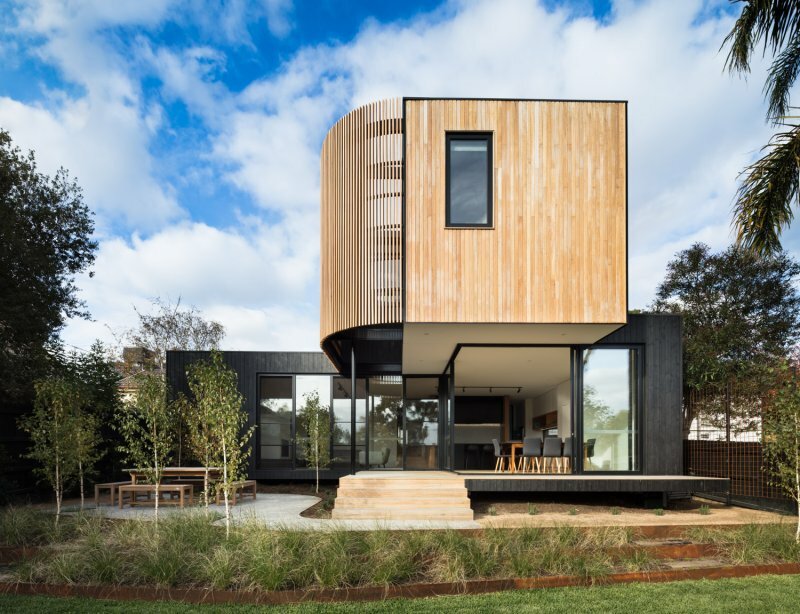 In Australia, we don’t have the extreme weather that prompted northern hemisphere countries to look for an alternative way to build – and develop modular construction. But we do have other drivers such as increasing building costs, and the labour shortage in the building industry running headlong into an increasing need for affordable housing. 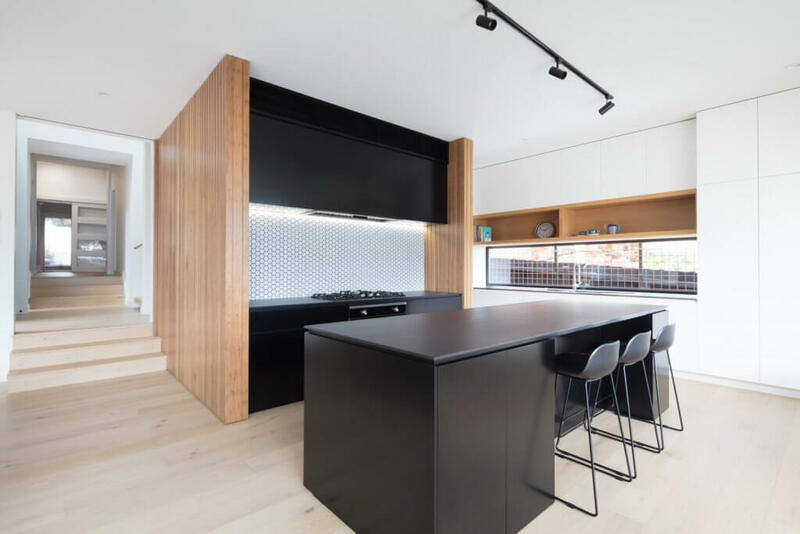 The University of Melbourne School of Engineering considers modular as one solution to these problems and is leading a push to increase prefabrication from 5 per cent to 15 per cent of new builds by 2025. It is supporting the sector with large-scale testing and training facilities at a campus to be built at Fishermans Bend.